The Ram-Pro 200 Feet Fish Tape will make you easy to move or thread cables and Re-Wire through drywall, conduit or insulation. Simply guide the fish tape through the narrow opening, attach wires to the pulling loop and guide the wires to the new location smoothly and efficiently. It is housed in a sturdy carrying Reel case and is made from high-grade carbon steel for performance. An easy reel out allows you to finish the job faster without straining your body. 1/8-Inch Wide 1/16 Inch Thick Steel 200 feet Long. • Save a lot of money by doing your own wiring. 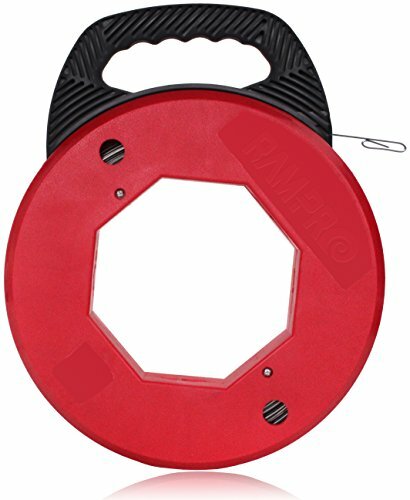 Even if you've never picked up an electrical tool in your life, you can safely rough-in wiring by using the ram-pro Steel Fish Tape Reel while running cable throughout the room, and making the electrical connections. • Easy-to-use installer's solution for pulling and installing cable in conduit. • Reel winds up and stores excess fish tape as the wire is pulled. • Strong pulling strength. Shatter proof. • Finger fitting grips around reel fits the hand comfortably. • Tape is wound directly into housing, no need to snap retaining tapes. • Greasy lubrication covers steel to help moving properly. • Exclusive hand trigger assembly helps wind tape tightly as it automatically wipes off excess lubricant. • End is tapered in formed Hook so that you can attach a cord or cable and pull it back through the wall. • Stiff enough for getting up a wall from the floor below. • Sturdy enough to support such an application. • No problem pushing it through several curvy parts of the conduits or raceway. • Glides through tricky bends without sticking or snagging. • Pull wire through a tight-spaced conduit or raceway with the Ideal Turf-Grip. • Trigger allows the snake to be forced without stressing the reel and always easy and smooth pull-out and rewind motion.